Sum Random Knowledge: Even the sign makers don't always get it right. Here's an easy to miss sign error. I didn't notice it until after I took the photo. This is the corner of Old Georgetown Road (MD-187) and Wisconsin Avenue (MD-355) in Bethesda, Maryland. It is the southern end of Old Georgetown Rd. 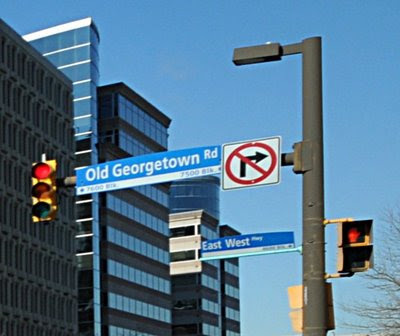 Old Georgetown gets the big sign which is understandable since you can turn left from Route 355 onto it and East-West Highway (MD-410) is one way the other direction. So what's the screw-up? The block numbering on the Old Georgetown sign. It says that the 7500 block is to the right, but it isn't Old Georgetown Road on the right. Worse yet, the 7500 block is on the left, not the 7600 block. The Clark Construction building is 7500 Old Georgetown Rd and it is to the left.